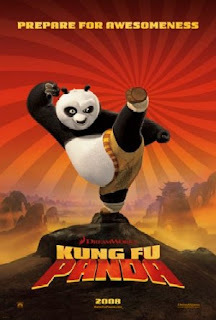 Po (Jack Black) is a panda who works in a noodle restaurant owned by his goose father Mr. Ping (James Hong), who hopes that Po will one day take over the restaurant. Po is a kung fu fanatic with secret dreams of becoming a great master in the discipline. However, his weight and clumsiness make his goal difficult to attain. The tortoise Master Oogway (Randall Duk Kim) has a premonition that the evil snow leopard warrior Tai Lung (Ian McShane), the former student of his own protégé, the red panda Master Shifu (Dustin Hoffman), will escape from prison and return to threaten the Valley of Peace. While Shifu sends Zeng (Dan Fogler), a messenger goose, to Chor Ghom Prison to have the security increased, Oogway orders a formal ceremony to choose the Dragon Warrior, a supreme master of kung fu who can defeat Tai Lung. It is assumed that one of the Furious FiveTigress (Angelina Jolie), Monkey (Jackie Chan), Mantis (Seth Rogen), Viper (Lucy Liu), and Crane (David Cross)a quintet of supremely skilled martial artists trained by Shifu, will be chosen for this honor. Po, in his attempts to see the Dragon Warrior, finds himself in the middle of the ceremony. Oogway, impressed by Po's sudden appearance, surprises everyone by designating Po himself as the Dragon Warrior despite Po's protests and Shifu's pleas to reconsider. Revolted at having Po under his tutelage, Shifu attempts to make him quit by berating and humiliating him. The Five also dismiss Po as a worthless interloper, although he eventually endears himself to them. Tigress later reveals to Po how Tai Lung came to be evil. Shifu raised him from a cub and treated him like a son. When Oogway refused to make Tai Lung the Dragon Warrior, he became enraged and laid waste to the Valley. He then tried to take the dragon scroll; Shifu tried to stop him, but could not bear to destroy what he had created. Tai Lung was then defeated by Master Oogway and imprisoned. Tigress ends her story by saying that Shifu loved Tai Lung like he never loved anyone before, or since. belief that he may never be a match for Tai Lung. Overhearing this discussion, Tigress takes it upon herself to intercept Tai Lung, and the rest of The Five follow her to assist. The following morning, Shifu discovers that Po is capable of impressive physical feats when motivated by food. He leads Po to the countryside for an intensive training regime in which Po is offered food as a reward for learning his lessons. As Shifu hopes, Po swiftly becomes a skilled combatant. The Five battle Tai Lung but are eventually defeated. All except Crane are paralyzed by a special nerve-striking technique, and he manages to carry his friends back to the valley. When they return, Shifu decides Po is ready to open the sacred Dragon Scroll, which promises great power to its possessor. However, when Po opens it, he finds nothing but a blank reflective surface. Stricken with despair at the scroll's apparent worthlessness, Shifu orders his students to lead the villagers to safety while he stays to delay Tai Lung for as long as he can. Po meets up with his father, who tells him the secret ingredient of the family's noodle soup: nothing. Things become special, he explains, because people believe them to be special. Realizing that is the point of the Dragon Scroll, Po rushes off to help Shifu. At this time, Tai Lung arrives at the palace to obtain the Dragon Scroll. However, he discovers that the Dragon Scroll is gone, and then attempts to kill Shifu in anger. But before he can, Po arrives and challenges him. Tai Lung temporarily stuns him and gains the Dragon Scroll, but is unable to understand its symbolism. Po tries to explain the wisdom of the scroll to a frustrated Tai Lung, who uses his nerve attack on Po, but the panda is impervious thanks to his amply-padded gut. Emboldened, Po counter-attacks, and uses the Wuxi Finger Hold (a technique Shifu had previously threatened to use on Po) on Tai Lung, defeating him in a large explosion of golden light that ripples through the valley. The Five return to the valley to investigate and find a slightly dazed but triumphant Po. Deeply impressed by Po's victory, Tigress leads the Five to acknowledge him as a Kung Fu master. Po suddenly remembers that his teacher is badly wounded, and rushes back to Shifu. At first the master appears to be dying, and Po panics. But Shifu is only trying to rest after such a terrible battle with Tai Lung. At the end of the credits, Shifu and Po are seen eating together beside the sacred peach tree. A peach seed planted by Shifu before Oogway's death has sprouted into a new plant.